Here is a car offer if your in the market for a new Mercedes. 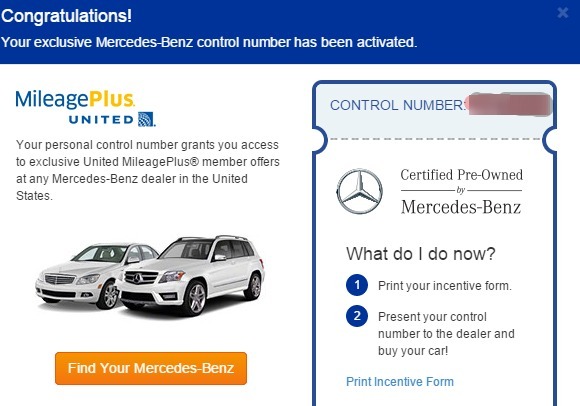 If you buy a new Mercedes and use a certificate from United they will give you “up to” 25,000 MileagePlus miles. The key part is the “up to” statement in the offer. In my personal valuation I find that United miles are worth roughly $10 per 1,000 so I figure this is worth “up to” $250. I would assume you would still get a good price and other discounts from Mercedes for the purchase. You might even be able to pay for part of the car or down payment with a airline credit card for more miles. It seems like a good idea but disappointing in the “up to” part depending on your loyalty level with United. They should just make it a flat amount for all members. Basically you log in with your united log in and it comes up with a form to confirm the amount you will get. Once you enter your info you will get the ticket that you can print and take to the dealer. Notice how I blocked out my control number “as if”. 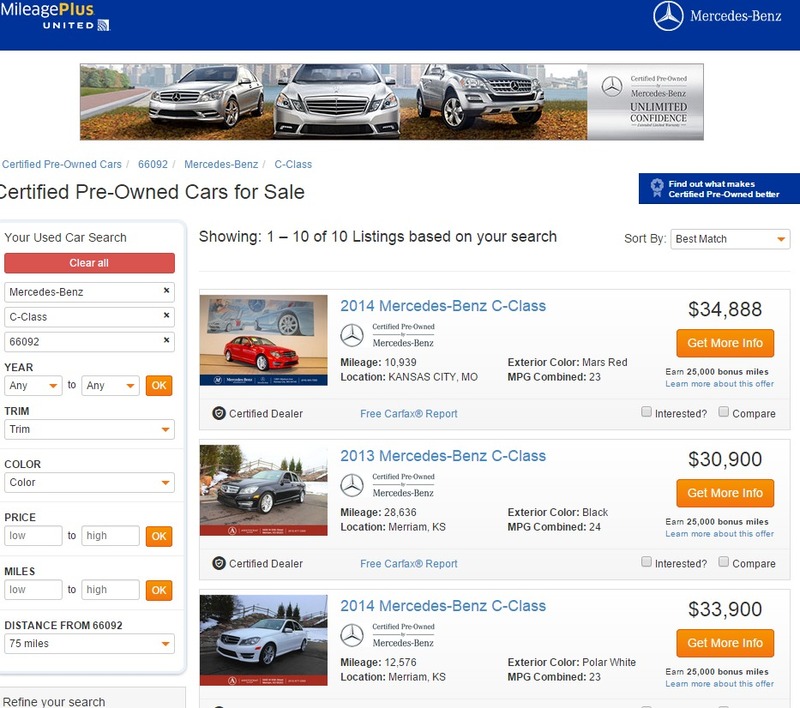 After you click the print form it takes you out to a Mercedes shopping site basically. But what’s weird is that the rules say it must be a new purchase or lease but the site shows you pre-owned or certified models. I assume you might be able to use it more flexibly based on the local dealership. So is it worth it? Not really unless your in the market anyway. My wife is after me to get her a new Mercedes but I’m just not all that impressed with the CLA or C class models I could afford. A used or certified model might fit the bill but it seems like a little work. Interesting offer though. What do you think? This offer was received in an email and seems somewhat targeted. You have to have been a United member for 6 months at least to get the full offer. The bonus mileage offer and incentives are only available to members who are eligible MileagePlus members at the time of an eligible transaction. An eligible MileagePlus member is a U.S. resident and has been enrolled in the MileagePlus program for at least six (6) months prior to the time of accessing the bonus mileage offer and incentives, or if less than six (6) months, has flown at least one (1) flight eligible to earn miles since enrollment. 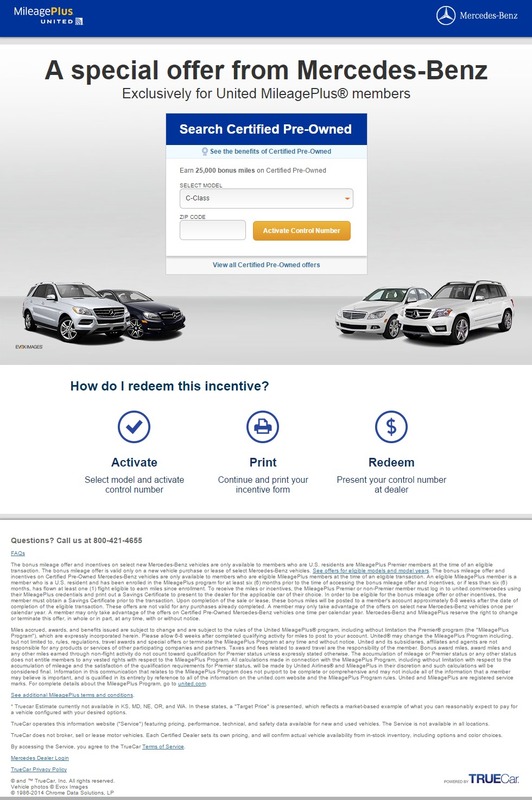 To receive the miles or incentives, the MileagePlus member must log in tounited.com/mercedes using their MileagePlus credentials and print out a Savings Certificate to present to the dealer for the applicable car of their choice. In order to be eligible for the bonus mileage offer or other incentives, the member must obtain a Savings Certificate prior to the transaction. Upon completion of the sale or lease, these bonus miles will be posted to a member’s account approximately 6-8 weeks after the date of completion of the eligible transaction. These offers are not valid for any purchases already completed. A member may only take advantage of the offers on Certified Pre-Owned Mercedes-Benz vehicles one time per calendar year. 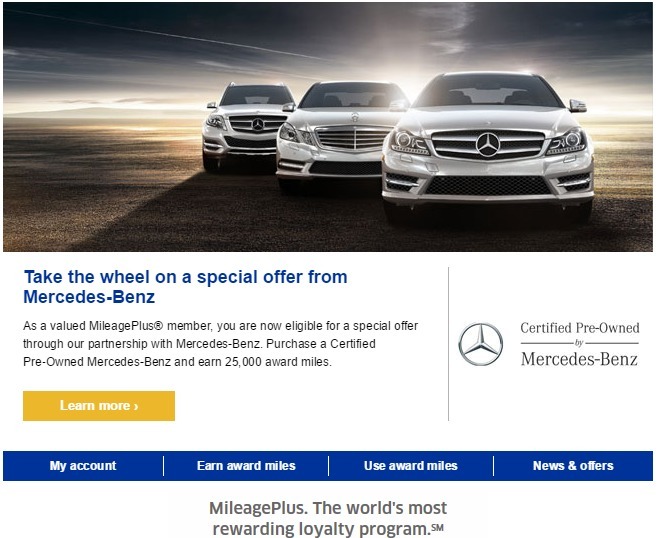 Mercedes-Benz and MileagePlus reserve the right to change or terminate this offer, in whole or in part, at any time, with or without notice. Miles accrued, awards, and benefits issued are subject to change and are subject to the rules of the United MileagePlus® program, including without limitation the Premier® program (the “MileagePlus Program”), which are expressly incorporated herein. Please allow 6-8 weeks after completed qualifying activity for miles to post to your account. United® may change the MileagePlus Program including, but not limited to, rules, regulations, travel awards and special offers or terminate the MileagePlus Program at any time and without notice. United and its subsidiaries, affiliates and agents are not responsible for any products or services of other participating companies and partners. Taxes and fees related to award travel are the responsibility of the member. Bonus award miles, award miles and any other miles earned through non-flight activity do not count toward qualification for Premier status unless expressly stated otherwise. The accumulation of mileage or Premier status or any other status does not entitle members to any vested rights with respect to the MileagePlus Program. All calculations made in connection with the MileagePlus Program, including without limitation with respect to the accumulation of mileage and the satisfaction of the qualification requirements for Premier status, will be made by United Airlines® and MileagePlus in their discretion and such calculations will be considered final. Information in this communication that relates to the MileagePlus Program does not purport to be complete or comprehensive and may not include all of the information that a member may believe is important, and is qualified in its entirety by reference to all of the information on the united.com website and the MileagePlus Program rules. United and MileagePlus are registered service marks. For complete details about the MileagePlus Program, go to united.com. See additional MileagePlus terms and conditions. Don’t miss the latest emails; add MileagePlus_Partner@news.united.com. This email was sent to danluttrell2002@yahoo.com by United Airlines. Please do not reply to this email. We cannot accept electronic replies to this email address. 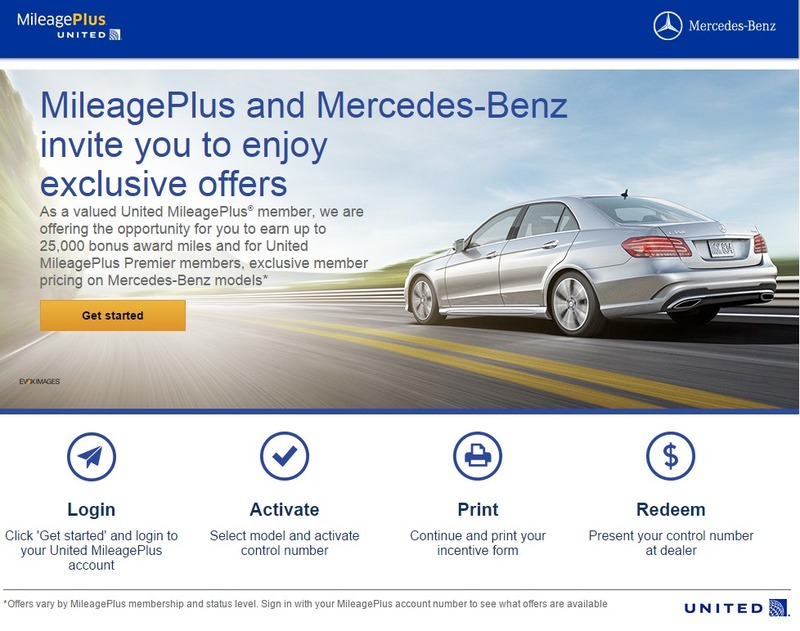 Email mileageplus@united.com with any questions about your MileagePlus account or the MileagePlus program. © 2015 United Airlines, Inc. All rights reserved.